The Investment Project of Hoa Thuong Residential, Trading and Service Area is located in Tan Kim commune, Can Giuoc district, Long An province; towards the Northwest of and 2km away from Can Giuoc town. The project is less than 20km away from the center of Ho Chi Minh City and 15km away from Phu My Hung Urban Area, enabling to utilize the existing facilities and infrastructures of this developed zone. In addition, while the housing fund of Ho Chi Minh City is getting smaller and smaller, the more and more people move here for living and working, Ho Chi Minh City is in urgent need of such satellite urban areas as Can Giuoc town to make population displacement as well as fix the problem of social security. Can Giuoc town is the urban center of Can Giuoc district - Long An province, locating adjacent to Binh Chanh district - Ho Chi Minh City via the National Highway 50. 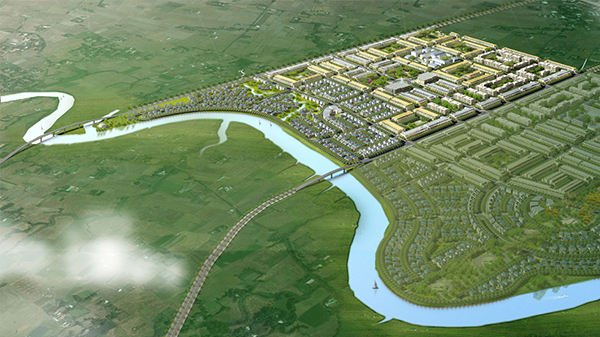 Can Giuoc town was formed relatively much earlier than other urban areas of Long An province; owning many advantages in term of road and water transport. Today, in accordance with the socio-economic development orientation of the province, the town is being planned to become the grade-III urban area with the population size of approximately 90,000 people. According to the master planning of urban construction at the rate of 1:5,000 of Can Giuoc town to 2025 approved by the People's Committee of Long An Province in the Decision 123/QD-UBND dated 07/01/2013, because the project is located adjacent to the expanding area of the town, it has many advantages and potential to develop. The design and detail plan at the rate of 1/500 of the project have been made by Hoa Thuong Corporation in collaboration with SWA Vietnam Co., Ltd., one of the groups having extensive experience in executing the project of designing master plan for residential areas over the world. Basing on the advantages of the project and the experience of the Owner in developing and constructing residential and urban areas, the Owner expects that once being completed and going into operation, the project shall create socio-economic benefits for Giuoc district in particular and Long An province in general, and contributing to improving the plan of Can Giuoc town in future. Notification 148/TB-UBND dated 13/05/2013 by the People's Committee of Can Giuoc District regarding the conclusion of the meeting on allocating land use index to receive investment of the projects of urban and residential areas developed by Hoa Thuong Corporation in the expanding area of Can Giuoc town (according to Decision 123/QD-UBND dated 07/01/2013 regarding the planning approval by the People's Committee of Long An Province). The Project of Hoa Thuong Residential, Trading and Service Area has an advanced location of being along the District Road 11, Belt Road 1 and 2 (under planning). Also, it takes only 40 minutes to drive from the center of Ho Chi Minh City to the project area via the National Highway 50 in normal traffic conditions. The project aims at building a modern - safe - environment friendly urban and residential area. Therefore, in addition to the area for housing construction, there is a big area for building such public utilities as green park (accounting for 10% of the total project area), sport center, 01 secondary school, 01 elementary schools, 02 kindergartens, 02 medical aid posts, and commercial and service area... to serve all daily need of the residents. Besides, the inter-project transport systems is synchronously planned and easily connected with the regional transport system like the National Highway 50, Hamlet Road 11, Belt Road of Can Giuoc town, which facilitates traveling from the project area to Ho Chi Minh City and the vicinity. In addition, Ho Chi Minh City is executing the construction of some Metro lines, in which the Metro line 5 with the starting point at Sai Gon Bridge and the end point at the new Can Giuoc Station (Binh Chanh district) is scheduled to commence in 2015. In future, the residents in the project area will have one more option of public transport to conveniently travel to Ho Chi Minh City as a result.